It’s a small world out there. 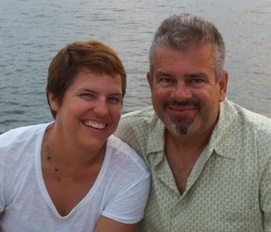 One evening, while cruising around Avalon Harbor in our dinghy, we came across Mark and Mimi on Mimiya. They were our next door boat neighbors back at Marina Village in Alameda. We knew they were on their way down the coast to San Diego. Next thing you know, we’re hanging out on their boat in Avalon. The forecast said the high winds and seas from the passing storm would calm down on Friday, and it was time to move on. Rather than make a marathon trip to San Diego, we decided to break up the distance with a stop at the highly recommended Dana Point (Orange County). The thirty-two mile passage was an uneventful motor/sail and I spent most of the time running the water maker while Trisha piloted the boat. As we neared shore, we got a first-hand look at the red tide that Southern California has been experiencing. The color of the water went from blue to reddish brown. There were occasional tide lines where deep blue streaks of clean water sliced through the red tide. Once at the Dana Point Harbor entrance, we made a hard left turn behind the sea wall that protected us from crashing waves. We were led to the west end anchorage by the harbor patrol and found a spot to anchor between the seawall and another anchored boat. Things were pretty quiet when we arrived on Friday, but that all changed Saturday when we learned that the harbor is well loved by the locals. During the weekend, there was marine traffic of all shapes and sizes: kayaks, paddle boards, out riggers, power boats, kids racing small sailboats, sailing lessons, an on and on. We also learned that, at low tide, a beach appears about a hundred feet from our boat and this is the harbor hot spot. We had a great time watching all the action. On Sunday, Chuck, our crew for the trip from San Diego to Cabo, made a hundred mile journey from his home to meet us. We showed him more about the workings of the boat, discussed the paperwork requirements for entering Mexico, and even worked out a watch schedule for our trip. We also did a dry run for rigging the spinnaker. We are very excited to have Chuck making the trip with us. During the night we got very close to the sea wall.